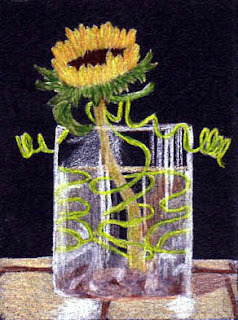 Sherry's Colored Pencil Corner: Illustration Friday - "Wired"
I went searching the web for inspiration for this one, and an image search on the word "wired" turned up this cool flower design idea, where colored wire is incorporated into the floral arrangement. Not the best result I've had on black, and I can't seem to get a good scan that really reflects the colors, but it was fun to do. ACEO size, Prismacolors on black Canson Mi-Teintes.